This place has lain fallow for a long time. What with moving jobs and moving house and then settling into a brand new place and then attempting (and failing) nano last year, it's been hard for me to write anything of note and so I haven't been posting here. I don't know if I can make a change just yet (work, though lovely, is still very full at the moment) but someone did ask me what my top ten books were recently. I know, it's a click-bait list article thing, and I can't really rank the books that I like easily. However, I think I can give you ten books that have stayed with me for "some reason" and briefly explain why. I can't promise any order to the list, any rhyme or reason to the inclusion of books or any great themes that I shall be exploring. Equally, there will be books that are missing simply by dint of me having read them too recently for them to have stayed with me yet, like How to be a Woman by Caitlin Moran and Kazuo Ishiguro's Remains of the Day, which are both brilliant books in their own rights and will no doubt make me think for a long while yet but, having only been read in the last few weeks, can't really qualify for the list. Then there's the influential books that shaped who I am today: Bernard Cornwell's Sharpe series, Tom Clancy's books, Colin Dann's Animals of Farthing Wood series or pretty much anything by John Wyndham (his short story Consider Her Ways was very much part of making me who I am, as was The Trouble with Lichen and, of course, Chocky). Obviously not all of those can make a list of ten books that have stayed with me, so the list will be culled and will be pretty random. Without any further ado then, the list continues after the line break. 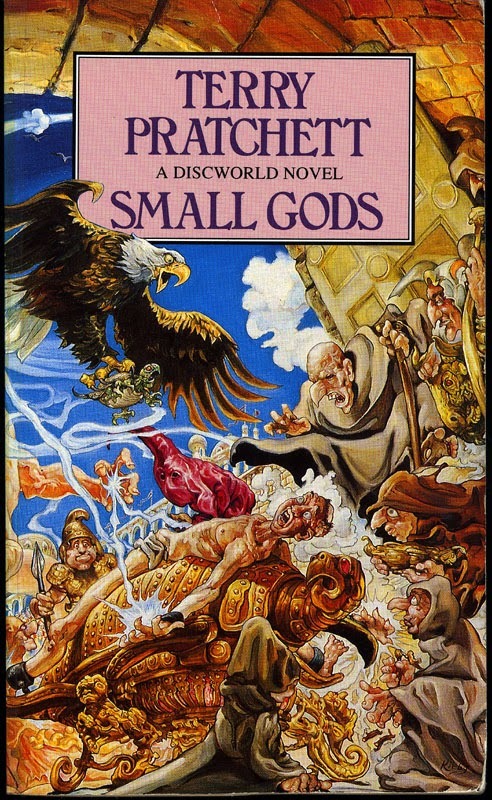 First on the list, for no particular reason, is Small Gods by Terry Pratchett. I read this when I was still a young teen. My father had not long since left the family and I had a belting headache and cold that was making me leave trails of snot everywhere. Adolescence was still relatively new but I had no idea how or if to experiment with things. In the midst of all this turmoil that I resolutely refused to engage with and tried very hard to ignore, I inhaled this book over the course of about 24 hours. Because I was feeling pretty permanently light-headed at the time - a combination of cold and the time of month - I think my brain was being hallucinogenic. As a consequence, this book made me think more deeply and more at length than I think it set out to do. I didn't find it funny, but I found myself thinking about the implications contained in it a lot. And for long afterwards too. This, obviously, makes the cut therefore. Also, if you haven't read it, do so. If you haven't read anything by Terry Pratchett then I recommend beginning with Guards! Guards! if only because that's the first one I read. 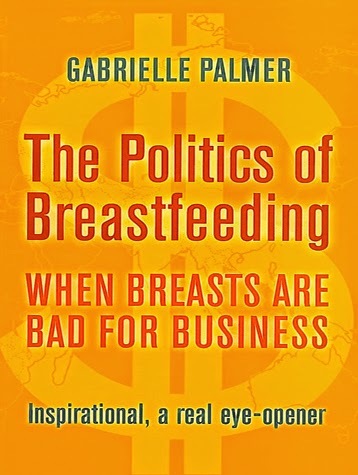 Next up, The Politics of Breastfeeding: when breasts are bad for business by Gabrielle Palmer. A Christmas present not long after the Boy was born. This is an explosive book for a whole host of reasons and I'd coveted it for a long time. When our youngest was born we started talking about how long breastfeeding should go on for, prompted by a programme on Channel 4 about children who still breastfed at ages 4, 6 and 7. This book kept coming up in our research and, when I finally got to read it, it was a powerful thing. There's stats, data and good narrative throughout about something that doesn't really hit the headlines the way it should. When I first read the chapter about the romp through history I was skeptical, I'm a historian and easy options automatically arouse my suspicions, but the more I looked into things and the more I learned the more I'm thinking that the overall gist is correct. Part call to arms and part sociology textbook and part political manifesto and all empowering, this is a book that I continue to recommend to friends and students alike. Even if you don't agree with any of the ideas contained it will at least make you think about why you think what you do, and that's always valuable. It was also the book that made me happy wearing the label "feminist". One of the most powerful factual books I've ever read I stole from my father's bookshelf when I was about ten. I read it in about a week and it simultaneously confirmed my historical obsession with the First World War and the need I have to hear from people who were there rather than relying on prettily written over-arching narratives that have few references. 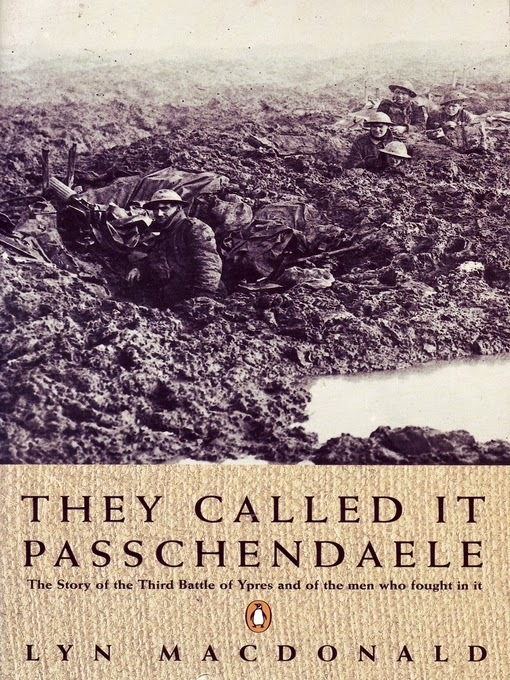 This is They Called it Passchendaele by Lyn MacDonald. My studies have since made me question some of the picture that she paints, but this remains my first foray into proper academic treatments of the First World War (as opposed to comics in the Victor for example) and so has very much stayed with me. The helplessness and futility of the campaign around Ypres in 1917, along with the mud, blood and rtenches reality of it, has informed how I go about looking at this period of history. Furthermore, the attention to detail and the fully revealed references, the social history if you will, has informed how I go about trying to understand warfare and teach it now that I am a history teacher. It's a very readable book and another contentious one. You may not agree with her conclusions or views, and I don't as much as I did, but it's still worth reading to get a sense of why you disagree or even why you agree. It has recently been bought and added to my own bookshelves as I doubt I'd ever get my father to part with it. As you know, I try to write now and again. And one of my projects whilst in University was attempting to write a story that had a non-linear narrative, one that could be read in any order and understood each time, though perhaps in different ways. Needless to say I have not yet succeeded and it is very hard indeed. 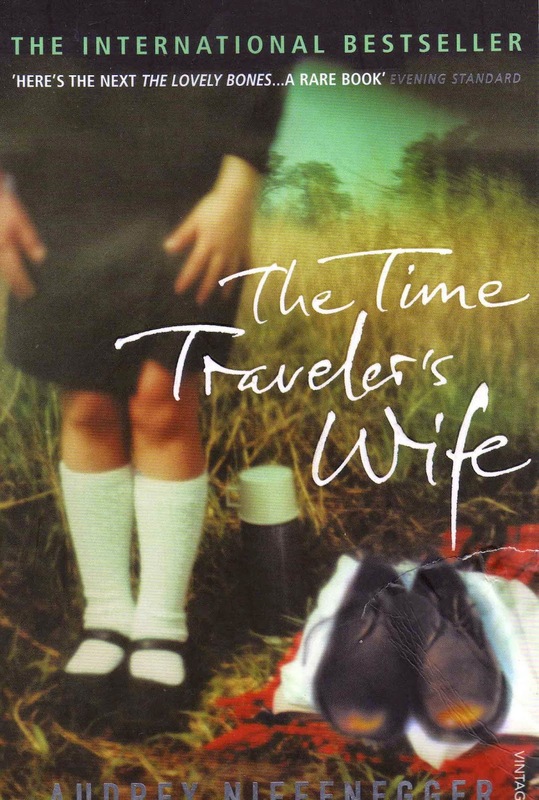 Knowing this, a friend of mine suggested The Time-Traveler's Wife by Audrey Niffenegger, then having just been released in hardback for the first time and I knew nothing more about it than the title and the fact that it was interesting. I read it, I loved it, and I loved the fact that it was indeed non-linear in construction. The love story was less powerful, and the scenes with the baby were a bit unnecessarily visceral (and did give me some bad dreams afterward, I'll confess) but the overall book was very cleverly done. The fact that you knew how it ended before it did but didn't know you knew was another very clever touch. It did for me for books what Memento did for me for films - the power of clever editing and good writing on a fairly simple plot-line. I still have this on my bookshelf and I did try to read it aloud to my ex, but that didn't go so well, apparently my voice is boring. I enjoyed the experience of reading aloud, for my part, and maybe one day I can convince my current partner to let me. Or else read it to one of the children. When they won't get bad dreams about the baby part. Oh, I don't know, it's a lovely book and deserves inclusion here.